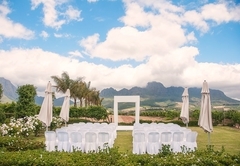 Stellenrust Wedding Venue has a remarkable view over Table Mountain and the whole of Stellenbosch. 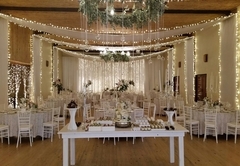 Situated amongst lush vineyards and the Stellenbosch Mountains, this venue evokes a feeling of freedom and peace. 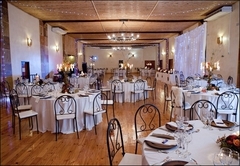 Stellenrust offers a 330m² banqueting hall, with pine flooring and Gothic chandeliers from a reed ceiling. 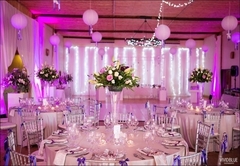 This makes the venue easily suitable for weddings up to 220 guests with a dance floor and 320 guests without a dance floor. 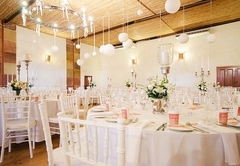 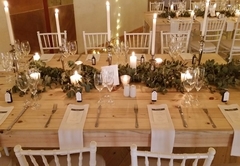 Stellenrust also has a newly built smaller venue for the more intimate weddings, hosting up to 60 guests with a small dance floor, or 100 guests without a dance floor. 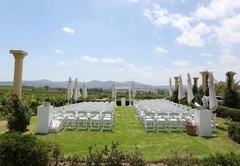 This venue can also be used for the ceremony if the weather does not allow a stunning garden ceremony. 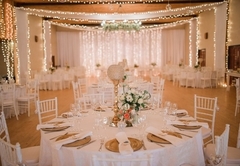 In 2011, we had the privilege of hosting 51 weddings and functions here at Stellenrust, from the small intimate to the big lavish 300 guest weddings. 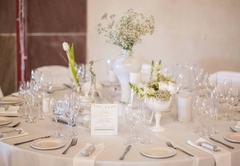 Our excellent service and attention to detail come out in each wedding, we welcome the bride and groom with all their different ideas to make this day for them a day to remember for ever! 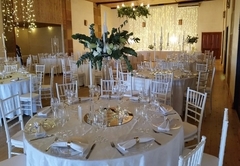 Stellenrust, have their own caterers, Malita Joubert, that offers menu’s (vat exclusive) with various options (buffet, plated, braai, cocktail etc). 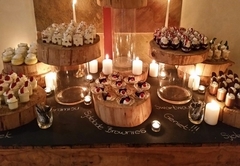 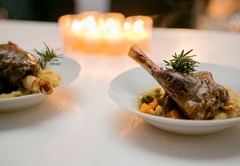 Malita and her professional team have been in the catering industry for more than 40 years and it shows with their delectable pre-snacks, starters, main courses and desserts. 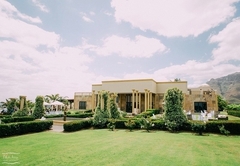 Stellenrust Wine Estate can boasts at being one of the largest family owned wine estates in South Africa. 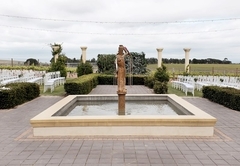 Wine making skills have been passed through the generations and the legacy of our motto “where excellence meets winemaking” is put forward in every bottle. 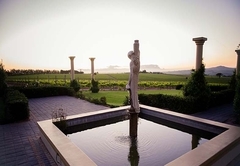 With more than 20 different wines that we offer here at the Estate, including a delicious Method Cap Classic, we are also the proud official producers of the Chenin Blanc & Rose wines for the 2012 Olympic Games in London!